Grumbling over the Supreme Court’s recent decision in Citizens United continue to rumble like distant thunder. Will the decision go down in history as one more in the Court’s long line of egregious opinions? Likely! Will it have much effect on the American political landscape? Likely not! Simply ask yourself, how much worse can it get? There is scant evidence that the Congressional attempts to limit corporate expenditures in electioneering have had any effect in reducing corporate influence in government. Expecting the Congress, most if not all of whose members reside deep in corporate pockets, to eliminate that influence can be likened to expecting the rhinovirus to eliminate the common cold. Corporate money is the diseased life-blood of American politics; it carries its cancerous spores to all extremities. · It is legal for a vendor to sell a product which does not work but illegal for a buyer to purchase a product with a check that does not work. · During a corporate bankruptcy, the company’s assets are distributed first to other companies and last, if anything remains, to employees and even people who have obtained judgments from courts for company wrongdoing. · If a homebuyer who has paid regularly on his mortgage for 20 and even more years, who has paid the property taxes and the property’s insurance, is forced to default for no fault of his own, such as a death, serious illness, or economic collapse, the mortgage holder gets to keep all the money and gets the house too, transferring the risk that investors are supposed to bear entirely to the buyer. · Entire industries can uniformly require consumers to accept contracts that require them to relinquish their legal and even Constitutional rights. · And those industries can also uniformly require consumers to accept contracts that the companies can change in any way at any time for any reason without gaining the consent of the consumer. Has a consumer ever had such a right? · Companies can collect personal information on people without their consent yet are allowed to keep company secrets even those which hide wrongdoing, as when a civil case is settled and the company involved is allowed to not admit to any wrongdoing and the court seals the detailed record. For more, see my piece How the Government Cheats Ordinary Taxpayers, but any astute reader can add items to this list. The Court’s opinions are exercises in obfuscation. Locating anything that can be called an argument is a daunting task. Claims are made and justified merely by citations to previous opinions. But this practice leaves behind the contexts and arguments of the cited cases. Unless one has a battalion of clerks, checking all the citations is practically impossible. Luckily, in Citizens United, Stevens, in dissent, has done the work. He clearly shows that the Court’s rationale lacks any logical basis and amounts to merely the claim that the Court’s majority finds the rationale in Austin not to be compelling. But this practice is ludicrous. To use one rationale that is not compelling to reject another that is not compelling can be likened to trying to refute a lie by uttering another. After all, the Court’s rationale in Citizens United was not found to be compelling by the four dissenting members. All split decisions are based on non-compelling rationales. This practice has widespread, deleterious consequences, for it follows that most, if not all, of the nation’s case law has no compelling foundation. The nation then is not one of laws but one based on the personal predilections of the Court’s members. See Corporate free-speech ruling speaks of shift in Supreme Court. It accounts for the inconsistencies in the examples cited above and for the massive disrespect for law and the Court exhibited by the people. Although Stevens has demolished the Court’s rationale, there is one important inconsistency that he overlooks. Kennedy, in the majority opinion, quotes Douglas in United States v. Automobile Workers: “Under our Constitution it is We The People who are sovereign. The people have the final say. The legislators are their spokesmen. The people determine through their votes the destiny of the nation. It is therefore important—vitally important—that all channels of communications be open to them during every election, that no point of view be restrained or barred, and that the people have access to the views of every group in the community.” But there is a more important conclusion that follows from the first three sentences of this quotation and the Court’s action. Look at it this way. (1) The people are sovereign; they have the final say. (2) The legislators are their spokesmen. (3) The sovereign people have said on numerous occasions through their spokesmen that corporate financing of electioneering must be limited. Yet (4) the Court rejects such limitations which nullifies the people’s sovereignty. Instead of the people having the final say, the final say is the Court’s. If the Court has the final say, then democracy in America is a sham. It simply does not exist and the Constitution has been subverted. No two ways about it: If the people don’t have the final say, the people are not sovereign. The Court has merely allowed the people to vote and the legislature to enact laws only to the extent that those laws don’t offend the sensibilities of the Court’s members. But this subversion is not recent. It happened in 1803 when Marshall, in Marbury, wrote, “It is emphatically the province and duty of the judicial department to say what the law is.” Unfortunately, no one objected, and from that moment on, the United States of America became an oligarchy. In this sham democracy, the ruling oligarchy, taking upon itself the duty to constitutionalize a specific deleterious economic system, is chiefly responsible for America’s ills. The legal system is unjust, domestic violence is prevalent, liberty is constrained, general welfare has been replaced by widespread adversity, and providing for the common defense has been reduced to providing for a military-industrial corporate complex. Not what the founding fathers had in mind! Although the efforts to amend the Constitution to overturn Citizens United may be laudable, even if they succeed, the amendment will not solve America’s fundamental problem. The Court will continue to rule. What’s needed is a way to return sovereignty to the people. Perhaps a Constitutional amendment stating that upon a petition of some percentage of the people, a decision of the Court is to be submitted to an up or down vote by the people in a referendum. Even such a procedure is not foolproof, of course, since referenda can be bought just as easily as elections. But the people would at least regain their sovereignty. The greater problem is the immorality that the Court has infused throughout American society. An unjust legal system breeds injustice. Everything known as virtuous is everted, and society is plundered. Such a society cannot endure. As its wealth and resources are plundered, the nation disintegrates. Social problems abound, resources are exhausted, the infrastructure collapses, poverty increases, ideological conflicts are exacerbated, and the Congress becomes dysfunctional. The nation drops lower and lower into Dante’s Inferno. This nation which bills itself as the world’s richest can neither provide the basic needs of its people nor pay its bills. The Court’s members write pious platitudes about the need to preserve the people’s “faith in our democracy” and “in their capacity, as citizens, to influence public policy.” If the court’s members believe that the American people still have that faith, they have been living in the asylum too long. Consider low voter turnout, the claims of many of those who vote that they selected the lesser evil of two alternatives, the low approval ratings of the Congress, the widespread beliefs that the more things change, the more they things stay the same, that the nation is headed in the wrong direction, and that all politicians are liars and crooks. But, of course, to a ruling oligarchy, none of this matters, does it? The greatest mistake human beings make in their endeavors is forgetting the goals of the enterprise. The founding fathers clearly stated the nation’s goals in the Constitution’s preamble. So J’accuse! 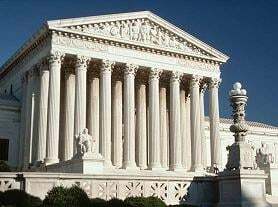 Every decision of the Court and every law that has failed to advance the goals enumerated in the Constitution’s preamble is facially unconstitutional. If “We the People” doesn’t mean that the people come first, then it means nothing.